File Sharing: you can share files over the internet in a secure manner that requires no upload. Photo Sharing: you can share photos directly from your PC, and just as with “File sharing”, you need not upload them online. Media Player: you can access your MP3s and playlist from any machine, no matter where you are. The Lounge: this is a self-contained chat service that runs on your machine and can be accessed by your friends via a direct link. Fridge: this is a virtual refrigerator where you can post notes. Share the direct link to your fridge so that others can post notes, or post notes yourself on your friends’ fridge – all notes are exchanged in real-time, securely and privately. A lot of time has passed since June and the Opera team has been hard at work; it has been working on Opera 10 and Opera Unite. 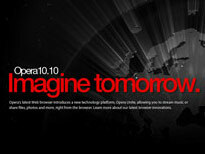 Today Opera Software announced the release of Opera 10.10 as a final, stable piece of software. The most interesting part about today’s release is that Opera Unite comes as a standard feature in Opera 10.10. Anyone can use Opera Unite in Opera 10.10 to share photos online or stream music libraries to another computer, mobile phone or game console. “We promised Opera Unite would reinvent the Web," said Jon von Tetzchner, CEO, Opera. "What we are really doing is reinventing how we as consumers interact with the Web. By giving our devices the ability to serve content, we become equal citizens on the Web. In an age where we have ceded control of our personal data to third-parties, Opera Unite gives us the freedom to choose how we will share the data that belongs to us." If you would like to get Opera 10.10 with Opera Unite, you can grab it straight from Opera Software here.